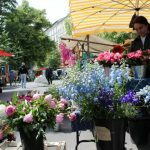 The traditional eco market is a project by the GRÜNE LIGA and is taking place in the heart of Prenzlauer Berg. The event occurs every Thursday from 12 – 7 pm and in winter (January – March) from 12 – 6 pm since more than 20 years. Retailers from Berlin and Brandenburg offer a huge variety of organic and ecologically grown products on an area of 150 m length with more than 40 stands. What makes the market so unique is the manifold supply of fresh and appealing products. 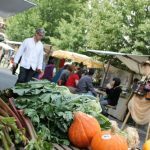 The market extends many things for example solid ones like cheese, meat or pizza but also sweet waffles, muesli, fruit, vegetables, herbage, teas and much more. The market works with the slogan ”Harvested in the morning, sold at noon” which makes the products very attractive. Aside from the groceries are many stands that offer clothes, jewellery, antiquarian books, flowers and more. The GRÜNE LIGA, a ecological movement, offers information about green subjects, projects and natur protection. The medley of the stands and the location radiate a cosy and notably flair which beautifies your day. During the summer season you are invited to stay for a while, calm down while having a cup of coffee and enjoy various kinds of cake. Warm meals are offered at noon. There is a playground for kids nearby. The market is well known wide beyond Prenzlauer Berg. It does not only attract people from the district but also visitors from other parts of the city and tourists as well. The market is known as a typical tourist attraction and should not be missed on a journey to Berlin. We can promise you a nice little experience on or market, it will worth it. We´re looking forward to see you. 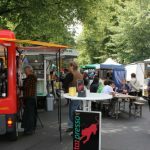 Phone: ++49 (30) 44 33 91-48, email: oekomarkt.kollwitzplatz@grueneliga-berlin.de. There is an additional advent eco market at the four Sundays before Christmas.